Shiloh was born May 9, 2004. He is pictured above going WD and BOW at the Altoona, PA shows 9/10/05. Terry put 4 singles on Shiloh before he went to Alan Waterman. 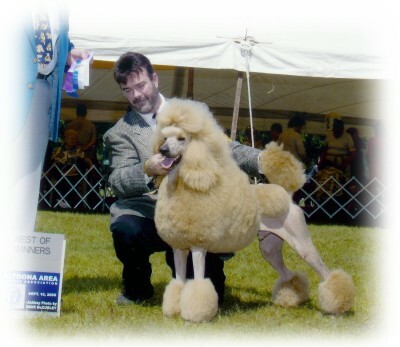 Under Alan's professional and expert handling, Shiloh finished his Championship with 3 majors and many major reserves. Look for him at PCA in the Specials ring.